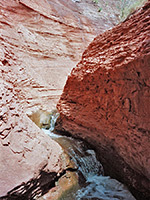 Professor Creek is a small stream that joins the Colorado River 20 miles northeast of Moab. 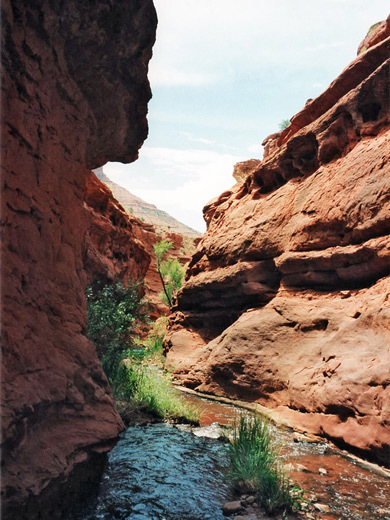 The creek flows year-round, along a canyon (known as Mary Jane Canyon) which is shallow for most of its length but one mile of the central section becomes fairly narrow and up to 100 feet deep. The walls have interesting rock textures and colors, different to most true slot canyons as the rock is darker, harder and less striated. The hike upstream is an easy walk, and very pleasant in summer as much of the journey involves paddling in the cool, shallow water. Along the edges of the creek, abundant green vegetation makes a nice contrast to the reddish canyon walls. From road UT 128, which links Moab with Cisco, near I-70, and 3 miles northeast of the turn-off to Castle Valley, a good quality gravel track (Professor Valley Road) heads southeast for 2 miles, past a cluster of ranch buildings. The road ends at a shady parking area right next to the creek, which is wide and meandering at this point. This part of the Colorado river valley has many ancient, eroded red rock formations - sandstone cliffs, buttes and pinnacles, similar to Monument Valley 150 miles south, and some are visible along the canyon, including the tall, solitary spire of Castle Rock. No permit or payment is required. 9 views of Professor Creek. TopoQuest topographic map of Professor Creek. A faint trail follows Professor Creek upstream for a couple of miles, taking short cuts over sandy areas in bends of the stream but also crossing the water many times. Cliffs gradually rise at either side, and eventually the path ends; the hike then involves walking in the streambed most of the time. In midsummer, the water is usually only a few inches deep and there are no obstructing boulders, so the journey presents no difficulties. The canyon is most interesting after about 3 miles when the walls are only 10 feet apart. Along the deepest, narrowest section there is a large boulder, 15 feet high, with a waterfall flowing over the top - a pretty feature, but one that prevents further progress upstream. However, there are routes to climb out of the canyon to the empty desert above and scramble back to the creek above the obstruction, such as up a sloping section of the cliffs on the west side after walking back downstream for about 5 minutes. Several steep, branching ravines cut into the surrounding land, and the ground is quite soft and sandy, so it takes at least half an hour to reach the creek again. 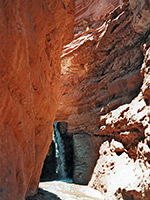 Above the waterfall is another short narrow section after which the canyon becomes V-shaped, shallower and less rocky as it ascends towards the La Sal Mountains.